Normally up for whatever wars the United States is getting involved in at any given time, Britain is apparently unwilling to go along this time in Syria. 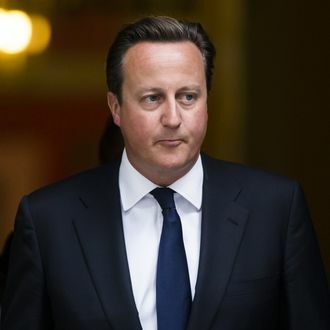 After parliament voted 285 to 272 against a motion endorsing the possibility of military action in Syria, Prime Minister David Cameron admitted defeat. “It’s clear to me that the British parliament and the British people do not wish to see military action; I get that, and I will act accordingly,” he says. Not a problem for the United States, however: Not long before the vote, the Times reported that President Obama is willing to pursue strikes against Syria with or without help from America’s usual war buddies. Acting without authorization from Congress may prove more difficult. Now 137 members of Congress have signed on to a letter demanding a vote, up from 116 on Wednesday. On Thursday evening, the Obama administration made its case to congressional leaders and the chairmen and ranking members of national security committees in a 90-minute conference call. Lawmakers heard from top officials including Secretary of State John Kerry, National Security Advisor Susan Rice and Secretary of Defense Chuck Hagel, but they offered few new details, as the briefing was unclassified due to a lack of secure phone lines. The officials on the call made it clear that they won’t be deterred by the lack of support from the British, saying, “The president will make a decision based on what is best for the U.S. and not what other countries would do,” according to Rep. Eliot Engel. Still, there may be one last alternative to going it alone. On Thursday France said it’s armed forces “have been put in position to respond” if President Francois Hollande decides to intervene in Syria, and he doesn’t need parliamentary approval for operations that last less than four months. Presumably France’s support is contingent upon Thomas’ Freedom Muffins being served in all Congressional cafeterias.